Hello, lovelies~ I am going to be 30 next month, so I want to share some information on the skincare ingredients that you may consider looking at once you hit the big three zero. 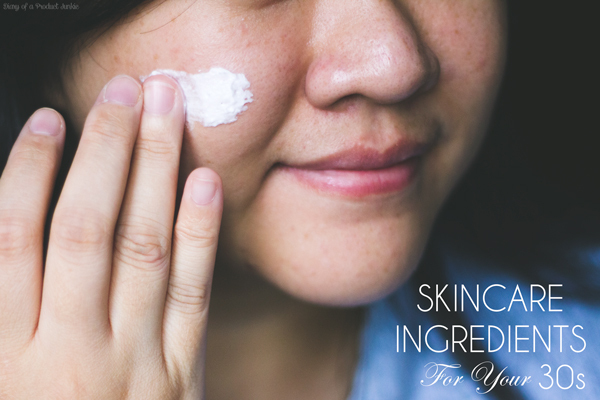 These ingredients may be present in creams, serums, or eye creams. Another use of this acne medication is that it stimulates the production of collagen and elastin that is responsible for bouncy skin with minimal wrinkles. It is best used at night because sunlight cancels out its action in boosting collagen production. Well, not typically found in your skincare creams here in Indonesia. However, you can find them in chemical peeling procedures in the doctor's office. It functions to regenerate the skin cells faster by helping the skin 'shed' off some of the dead skin cells. The more we age, the slower our skin cells regenerate, resulting in the dull appearance in your skin tones. Try to make it a habit to use skincare products that has brightening agents, such as Alpha Hydroxy Acid (AHA), niacinamide, or hydroquinone. If you prefer naturally derived ingredients, you can try kojic acid, azelaic acid, or arbutin. This is the one anti-aging skincare product that people often forget. The UV rays from the sun is one of the main cause of aging because the UV rays 'destroys' the collagen and elastin in our skin, thus making the skin more saggy and loaded with wrinkles. Remember the UV rays that contribute to aging our skin? Well, that's not all. The process itself creates free radicals that continue to destroy the collagen and elastin until it is wiped out. This will then lead to fine lines and deep wrinkles on the skin. However, with the help antioxidants, the free radicals are stopped from doing the dirty deed. It also helps to increase the production of collagen and elastin as well as repairing the damaged skin cells.